As development and subsequent habitat destruction accelerate, there are increasing pressures on wildlife populations. In Bringing Nature Home, Douglas W. Tallamy reveals the unbreakable link between native plant species and native wildlife—native insects cannot, or will not, eat alien plants. When native plants disappear, the insects disappear, impoverishing the food source for birds and other animals. In many parts of the world, habitat destruction has been so extensive that local wildlife is in crisis and may be headed toward extinction. But there is an important and simple step we can all take to help reverse this alarming trend: everyone with access to a patch of earth can make a significant contribution toward sustaining biodiversity by simply choosing native plants. By acting on Douglas Tallamy's practical and achievable recommendations, we can all make a difference. Doug Tallamy is a professor in the Department of Entomology and Wildlife Ecology at the University of Delaware, where he has authored 95 research publications and has taught insect related courses for 39 years. Chief among his research goals is to better understand the many ways insects interact with plants and how such interactions determine the diversity of animal communities. 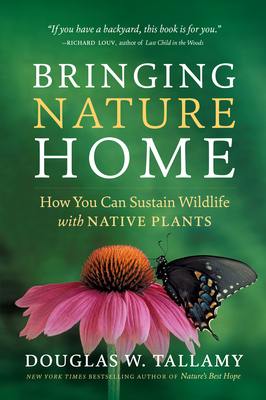 His book Bringing Nature Home was awarded the 2008 Silver Medal by the Garden Writers' Association. The Living Landscape, co-authored with Rick Darke, was published in 2014. Doug's new book Nature's Best Hope will be available February 2020. Among his awards are the Garden Club of America Margaret Douglas Medal for Conservation and the Tom Dodd, Jr. Award of Excellence, and the 2018 AHS B.Y. Morrison Communication Award. Rick Darke is a landscape design consultant, author, lecturer, and photographer based in Pennsylvania who blends art, ecology, and cultural geography in the creation and conservation of livable landscapes. His projects include scenic byways, public gardens, corporate and collegiate campuses, mixed-use conservation developments, and residential gardens. Darke served on the staff of Longwood Gardens for twenty years and received the Scientific Award of the American Horticultural Society. His work has been featured in the New York Times and on National Public Radio. Darke is recognized as one of the world's experts on grasses and their use in public and private landscapes. For further information visit www.rickdarke.com.